Given how notorious Saxhleel would later become, the details of his early life remain shockingly sparse. We know he was born in Black Marsh. We know that he was arrested in Morrowind at some point in his early twenties, having apparently carried out the murders of several high-ranking Dunmer officials. We know he led the prison break on a Vvardenfell labor-mine, which resulted in several dozen convicts vanishing into the ash-choked landscape. And we know that, upon his return to mainland Tamriel, Saxhleel turned not to Black Marsh, but to a mercenary company working out of Cyrodiil. 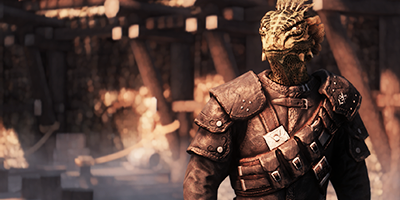 As the Blackwood Company's methodical enforcer, Saxhleel helped propel some of Cyrodiil's most influential criminals to ever greater heights. Saxhleel was eventually dispatched to recover renegade Company asset Teegla, the only stipulation being that Teegla had to be alive when he faced Company justice. What followed was a deadly game of cat-and-mouse, spanning across the entirety of Tamriel. Teegla may have had the virtue of speed, but Saxhleel was patient and relentless - not to mention blessed with a seemingly endless network of contacts. Unfortunately for him, the Imperial Legion's recent expansion into Skyrim has curtailed some of the Blackwood Company's influence. The relentless politicking of the criminal underworld has kept Teegla safely ensconced within the Thieves' Guild of Riften, part of Guildmaster Frey's "winning hand". But Teegla has a habit of testing his allies' patience, and Saxhleel knows it's only a matter of time before Frey's prized bargaining chip becomes a double-edged sword. As far as anyone knows, Saxhleel has been a mercenary his entire life. He's good at what he does, and it shows. Despite this, Saxhleel isn't quite the loyal asset the Company believes him to be. With his own network of contacts to rely on, Saxhleel's peers in the Company have long speculated what he gets out of his association with them. As his pursuit of Teegla reaches its inevitable conclusion, the Company seems confident that it'll be given the chance to mete out "justice". 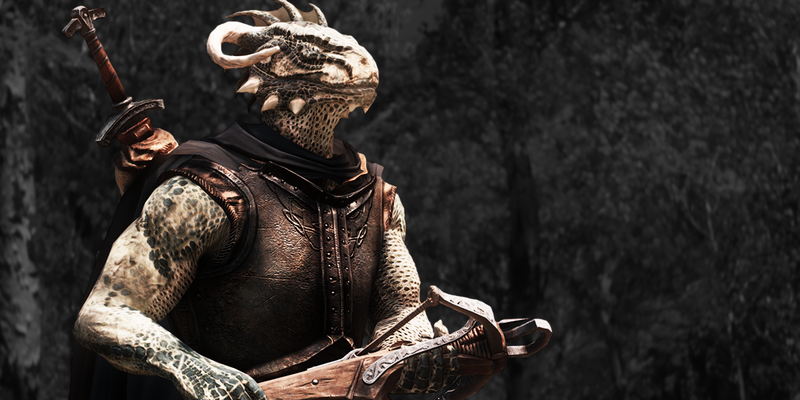 But they're not the only ones with a use for resourceful anti-establishment argonians. Across the border into Black Marsh, the An-Xileel eagerly awaits Saxhleel's return. Saxhleel has been tasked with hunting Teegla down for the Blackwood Company. He may admire his quarry's tenacity, but Saxhleel knows it's only a matter of time before the net closes. 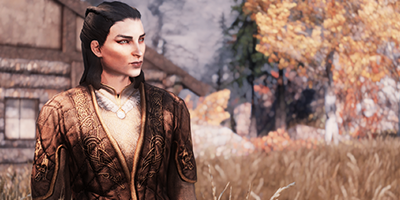 Whilst in Skyrim, Saxhleel has been enjoying the dubious hospitality of Riften's self-made oligarch. Maven thinks she's got him wrapped around her little finger. She couldn't be more wrong.